Today is my daughter’s TENTH Birthday. 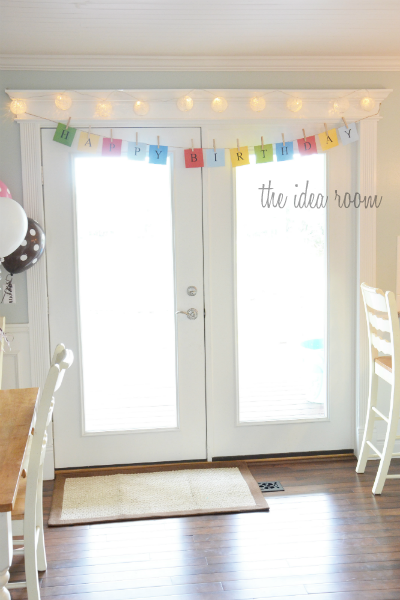 And while I was hanging up our super simple Happy Birthday Sign, I realized that I haven’t ever shared it here on the old blog. Not that it is anything super fancy or fantastic. In fact it is super simple. But sometimes when you have a lot going on, simple can be exactly what you need. To make one all you need is to cut out your letters for the word H-A-P-P-Y-B-I-R-T-H-D-A-Y onto some black scrapbook paper. I used my Silhouette CAMEO. Then I glued the letters onto some fun colored polka dot cardstock I had cut out into 4 inch squares. If you don’t have a CAMEO, no worries…simply print (or hand draw) some letters onto your favorite paper. 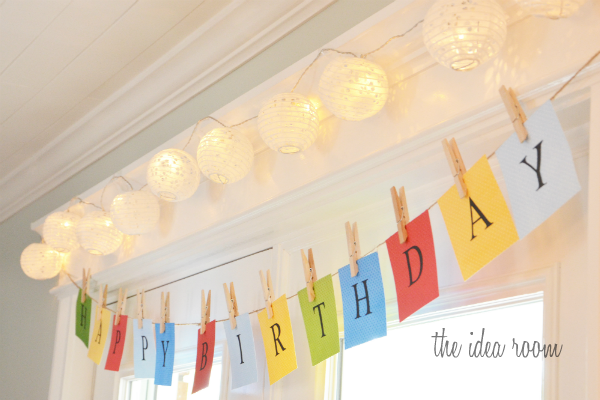 Grab some clothespins and a piece of twine or rope and string it across the room. Super simple but fun and festive too! The lights? Well those are from Martha Stewart. They are powered by a battery so you don’t have to worry about what to do with the ugly electrical cord. And the battery is small enough that it is tucked right in the top of the crown molding over the door. No one is the wiser. I love this idea. My son’s 2nd bday is coming up and I am putting together ideas for the party. This is definitely going on the list. Thanks for sharing! Thanks Eve! I hope he has a great birthday! I LOVE two year olds! 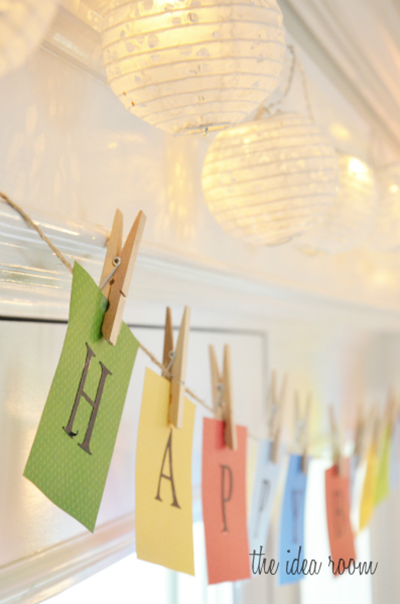 I have twine with those adorable tiny clothes pins still pinned to my wall from hanging Christmas cards. Right now, it is displaying kids’ art work, but you can bet that it will eventually display a greeting like yours in the near future. Like Gina said, I love the simplicity. I LOVE the idea of hanging Christmas cards and kids art work. I may keep mine up longer too! Thanks for sharing that Christy! I love little things like that. Electrical cords in plain view kind of drive me crazy! I have a few issues! Very cute! I love the clothes pins. Lots of fun things you can do with clothes pins. I need to get me some mini ones too! Simple and easy makes it an even better banner! Totally agree Suzanne! Thanks for stopping by and commenting. I always appreciate it! Cute Amy! Hope you had a fun birthday-filled week! Thanks Tauni! It was busy but fun! You had one last week right? So cute! Where did you find the Martha Stewart lights? Love them!! I found mine at our local Ben Franklin store. I wonder if Hobby Lobby or Michaels would also carry them? Love it!!! Wanted to let you know that I finally did the Sidewalk Chalk Painting you wrote about and included it on my own list of kids activities, giving you credit. Thanks for the fun times! LOVE the simplicity of it. Gorgeous! Love it! 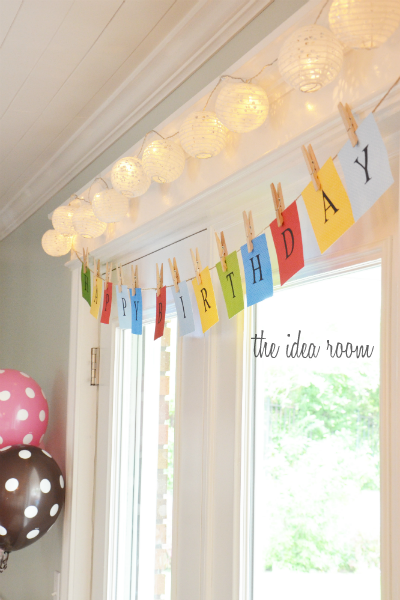 I did something similar for my daughter’s birthday, but I sneaked in her room while she was sleeping and (verrrrry carefully) hung the banner and tissue paper flowers over her bed. She woke up to a fun birthday surprise! I love the paint color on the walls. What is it? Adorei seu site, são idéias maravilhosas! How do you get the clothespins to stay upright? It looks so cute! Hi, I know this is an old post, but LOVE IT!!! I tried finding the lanterns but in vain. do you remember what they called them? Target sells some now!! They are in the wrapping paper section and party section! Otherwise they are called lantern lights.